Make a Memory...Quilt Block...That Is! 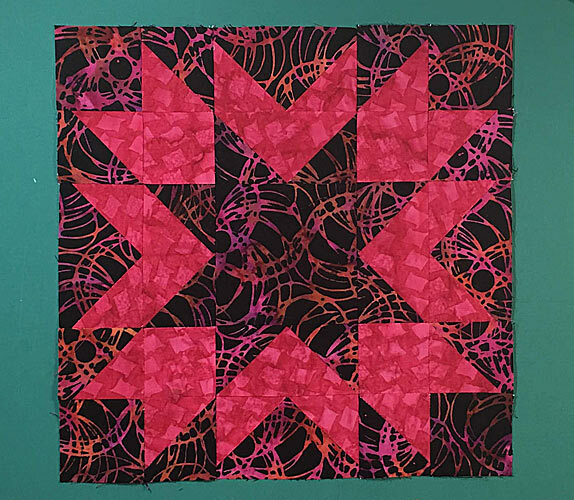 Our Memory quilt block stitches up in a flash. 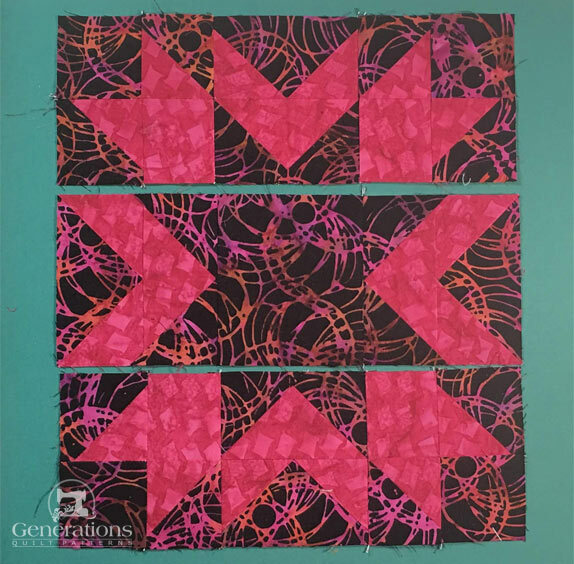 Quick-pieced half square triangles. 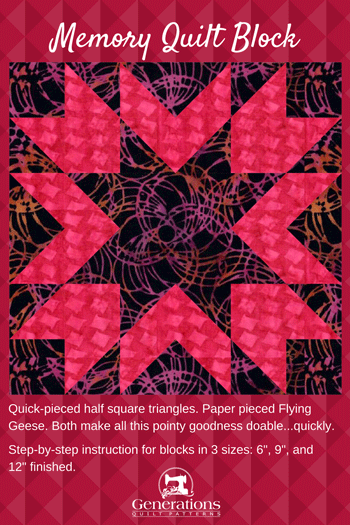 Paper pieced Flying Geese. Both make all this pointy goodness doable...quickly. Each time you press, the first time is with the patches 'closed', just as they were sewn. This sets the seam. Then open the patches and press again with SAs towards the darker fabric unless otherwise noted. Paperpieced SA are always pressed toward the last added patch. 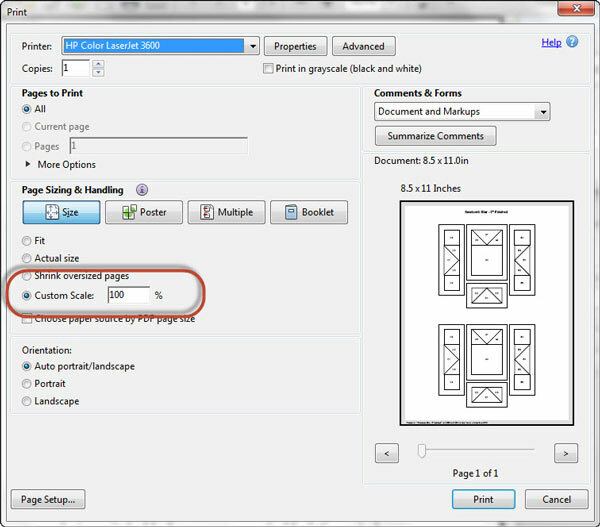 Pressing instructions are highlighted to make them easy to find. The block can be a little lumpy between the units. Check out my favorite (super simple) pressing technique to squash them into submission. I've recently acquired a Magic Pressing Mat—2 actually—and it's really upped my pressing game. Read my review here to see if one might make it into YOUR bag of tricks. Choose your finished block size from the chart below and print the corresponding number of copies for a total of four units. This is a dramatic block. To up the wow factor use fabrics with high contrast. If at all possible, make the dark fabric duller (grayer) than your light choice.That makes the lighter fabric really glow. Label all your patches. Their numbers are used throughout the tutorial. 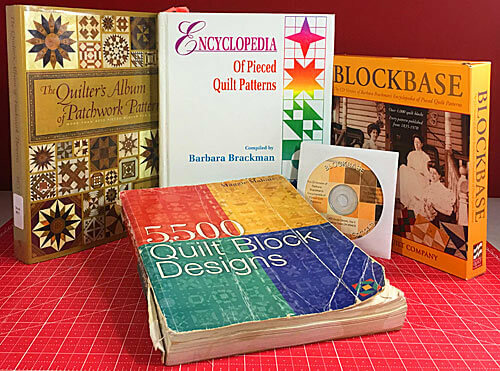 Click here to print a copy of the block design and cutting chart to use at your cutting table. 1	 Dark	 1	 3⅝"	x	3⅝"	 4⅝"	x	4⅝"	 5⅝"	x	5⅝"
2	 Light	 4	 2⅜"	x	2⅜"	 2⅞"	x	2⅞"	 3⅜"	x	3⅜"
3	 Light	 1	 3⅝"	x	3⅝"	 4⅝"	x	4⅝"	 5⅝"	x	5⅝"
4	 Dark	 4	 2⅜"	x	2⅜"	 2⅞"	x	2⅞"	 3⅜"	x	3⅜"
Use a tiny swipe of Elmer's Washable glue stick to position #1. Use the dashed placement lines (white arrows) for perfect positioning. With RST, align the long, bias edge of a #2 sky with one short side of #1. The point of the patch should be lined up with the corner (white arrow). Stitch starting and ending a good 1/4" before and after the solid line between #1 and #2. I do not backstitch at either end. 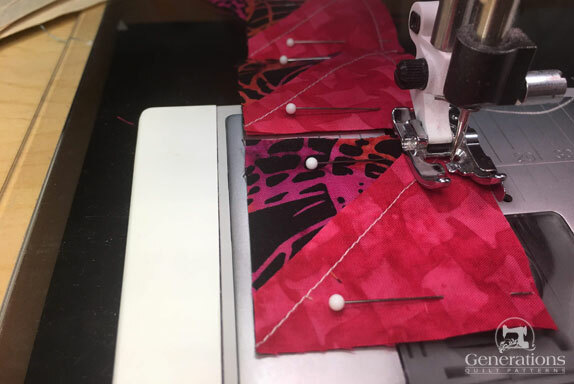 However, if you are a backstitcher, only the outside edge is a good candidate here because no future line of stitching crosses these stitches until after the paper is removed and the FG is sewn to other patches in Step 3. 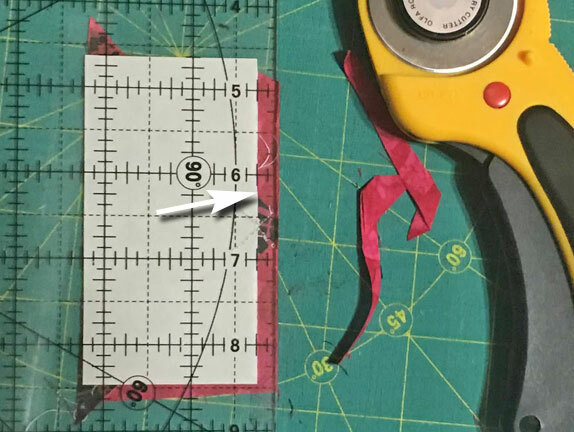 This line of sewing should end at approximately the tip of the white arrow at the dashed line. Add the second #2 in the same manner and press. Next we trim to establish the placement line for #3. 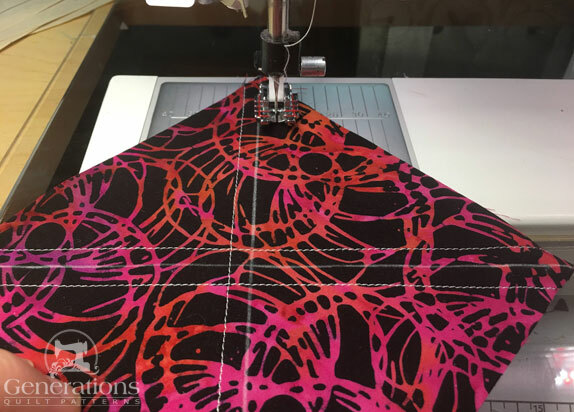 At your cutting mat, place the stitched pattern printed side up. 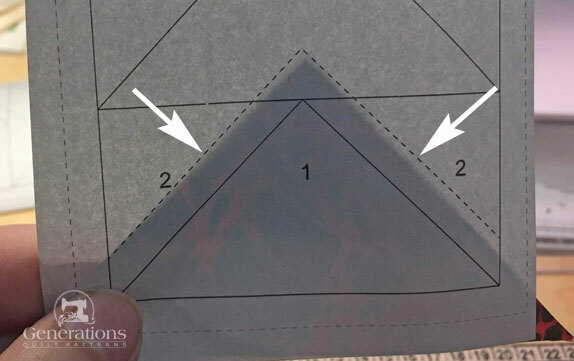 Tear the stitches away from the paper a bit at the solid line between #2s and #3 so that you can fold the paper pattern back along this solid line. 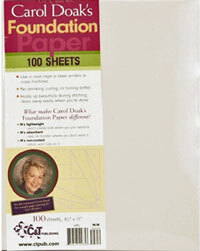 I position my line on that line creasing the fold with my thumbnail. 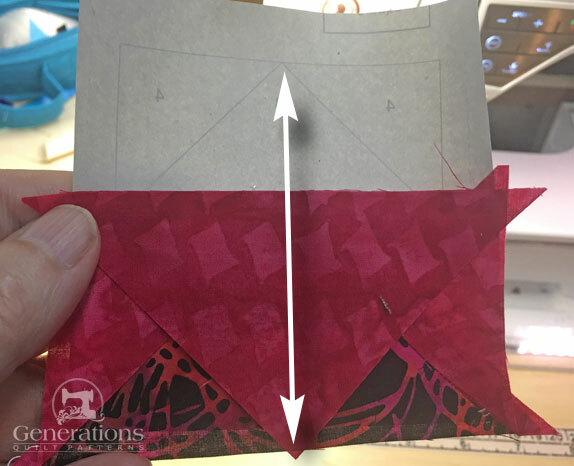 Fold the pattern back along the line. 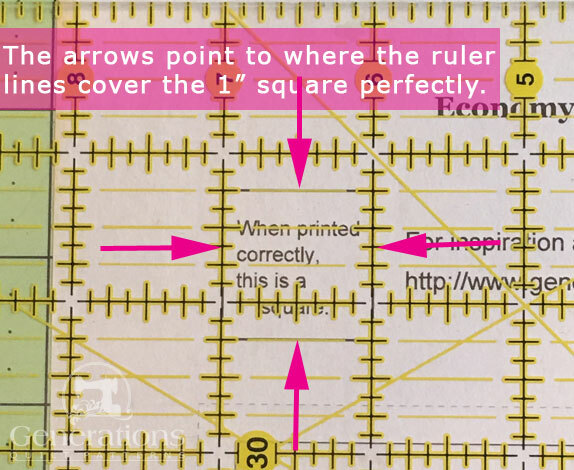 Now position the 1/4" mark on your ruler along the fold line to identify the 1/4" SA. Trim with your rotary cutter. 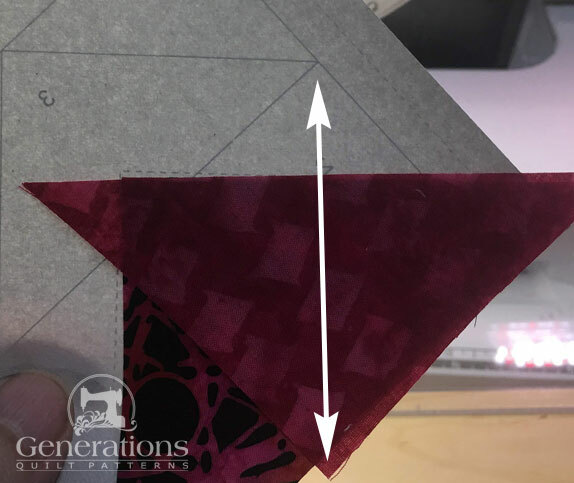 Align the long edge of #3 with this cut edge for perfect placement! The point on #3 should be opposite the point at the top of the Goose (white arrow). Stitch starting and ending a generous 1/4" outside the solid line between #2 and #3. Since we're stitching from edge to edge, you can chain piece this part of the unit. See that pesky thread tail in the center of the unit? Since it doesn't bother me, I don't trim threads from the printed side of the paper until the unit it completely stitched. However, I ALWAYS trim to remember to trim the thread from the fabric side of the unit as I go. Much easier that way. Time to trim again. Again to establish the placement lines for the #4s. 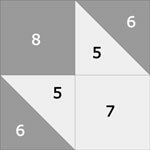 Fold the pattern back on itself along the solid line between #3 and #4. 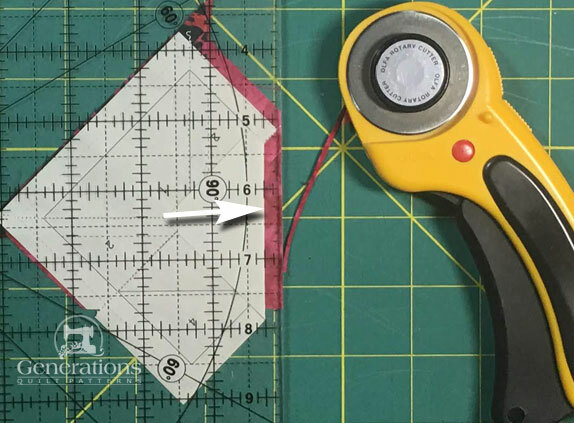 Position the 1/4" mark on your ruler on the fold line and trim. Repeat for the other side. With RST, position a #4 with one side of the #3. Just as with #3, we're stitching from one edge to the other so we can chain piece these units from here on out. 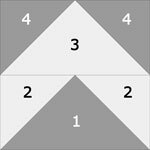 The point of the triangle #4 patch is opposition the corner of the unit. After stitching the unit looks like a hot mess (left). But after trimming, it's perfect. Trim by aligning the quarter inch on your ruler with the solid outline of the unit and trim, repeating for all four sides of all four units. Don't forget to remove the paper after trimming. Give the units a final pressing. 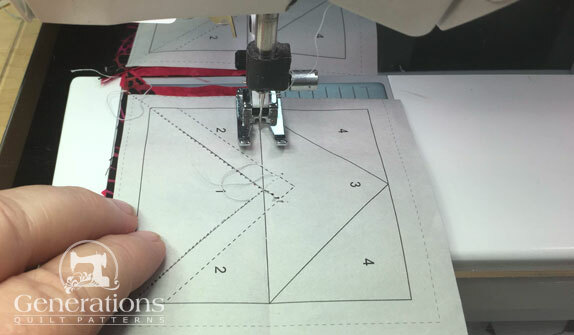 Return your normal piecing stitch length. Install your favorite quarter inch foot. On the back side of either the #5 or #6 patch (whichever one is easier to see your marks on) drawn two diagonal lines. My (favorite) Bohin Mechanical chalk pencil is easy to see on the darker fabric. With RST, stitch a 1/4" away from both sides of both lines. Press flat to set the seams. Find your Finished Block size in the chart below. 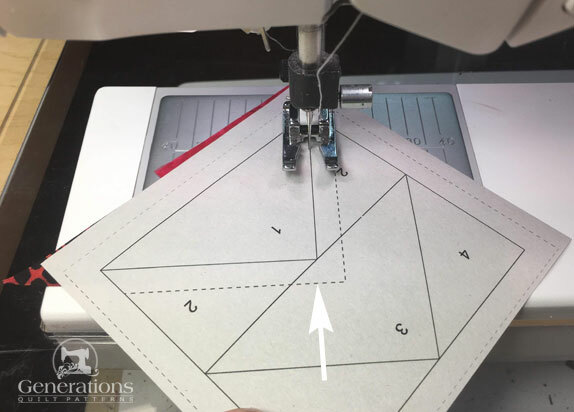 Using the Center Measurement cut your sewn #5/#6 into four equal squares. Then cut each in half along the drawn line. You now have eight HSTs ready to trim. 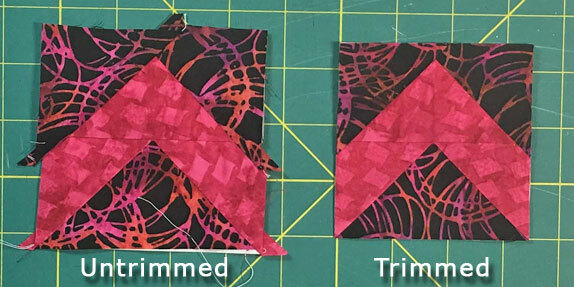 Referring again to the chart, trim your HSTs to the 'Trim to...' dimensions. 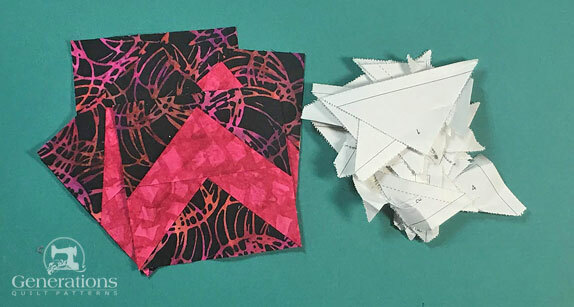 Below is a HST after cutting in eight patches (left), pressed with the SA towards the dark (middle) and after trimming to the perfect size (right). 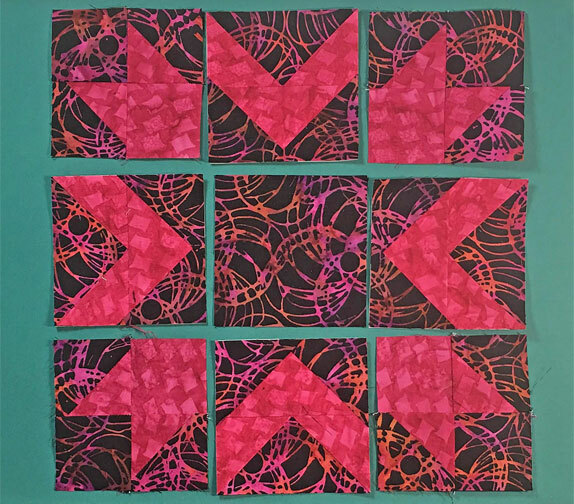 Repeat for all eight HSTs. 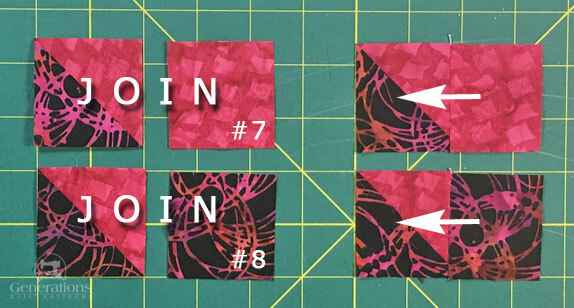 Use the images below to create four each of a #7 plus a HST and four of a #8 plus a HST. SA are pressed in the direction of the white arrow towards the HST for both. Pinning helps if you have trouble keeping all the edges even...you can chain piece to speed things up. With RST and nesting the SA join one of each unit together, pressing SA in the direction of the white arrow. 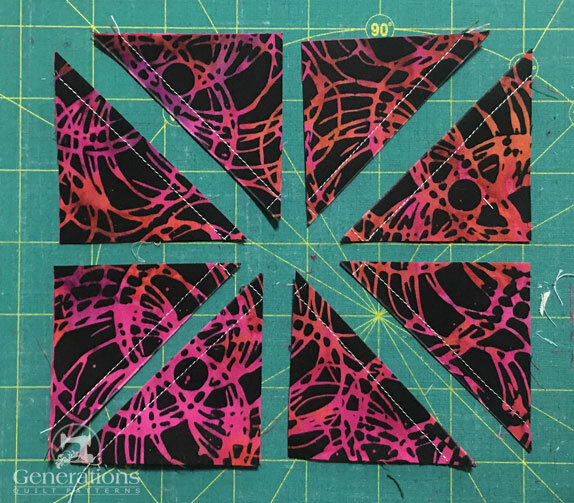 Lay out all your sewn and one cut patch to form the Memory quilt block design. Solid dark squares are in the outside corners. Flying Geese point out from the center. Sew the units into rows. 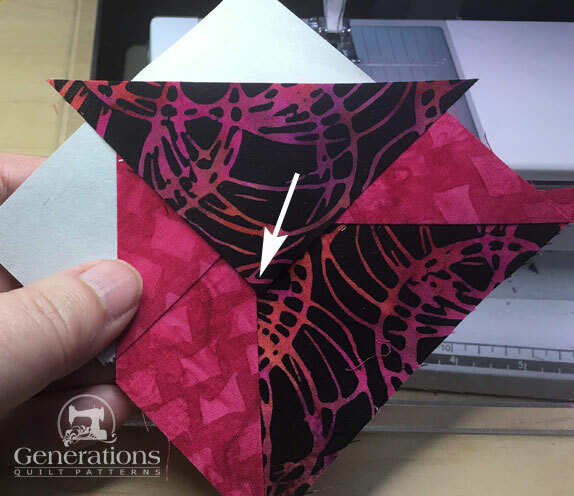 If you've followed the pressing directions, the seams of the HST and Flying Geese all nest to make matching the points pretty easy. I did pin to hold things in position as I stitched. 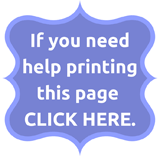 Click here for 'pointers' (no pun intended!) on pinning for perfect points. 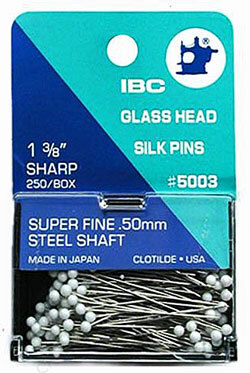 My favorite pins for this type of picky matching are IBC Super Fine .50mm show here. After stitching the SA are pressed AWAY from the Flying Geese units. 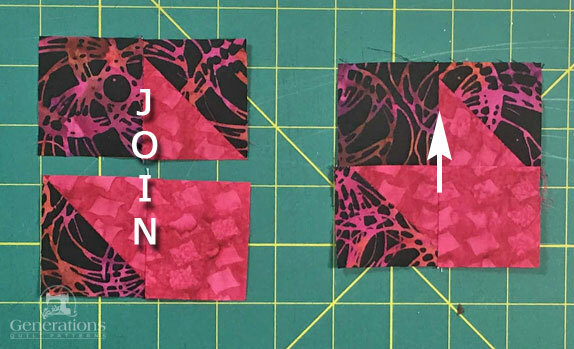 Stitch the rows together to create your Memory quilt block. Again, pinning as needed to help you hold the patches in position. These last two seams are pressed away from the center. Here is our finished 'Memory' in all its pointy goodness. Though our sample is made with just two fabrics, there's no reason that you couldn't use three. Here is that Memory block variation and its cutting chart. 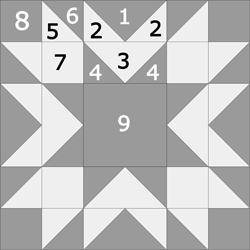 1	 Med	 1	 3⅝"	x	3⅝"	 4⅝"	x	4⅝"	 5⅝"	x	5⅝"
2	 Dark	 4	 2⅜"	x	2⅜"	 2⅞"	x	2⅞"	 3⅜"	x	3⅜"
4	 Light	 4	 2⅜"	x	2⅜"	 2⅞"	x	2⅞"	 3⅜"	x	3⅜"
Click here to print a copy of the block design and cutting chart for a 3-fabric Memory quilt block. 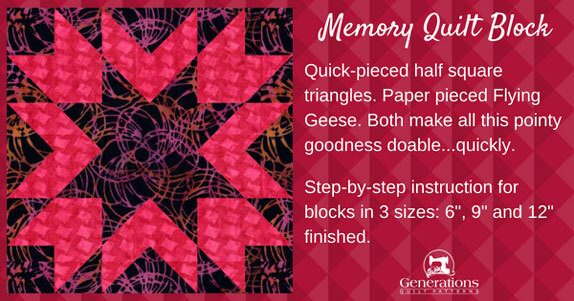 You need to download and print the same paper piecing patterns to complete this version of the Memory block.